A trip to London would hardly seem complete without a visit to one of England’s most heralded landmarks – Harrod’s Department Store. Encompassing over five acres, it was difficult to shop the entire store with so little time. No wonder the store’s motto is “Omnia Omnibus Ubique” which translated means “All things for all people, everywhere.” It certainly seemed plausible with over 1,000,000 feet in showroom space. The store opened in 1834 but it was not until much later that the prestigious holiday displays made it world famous. Adding to the nostalgia of holiday traditions at Harrod’s, in 1986 they introduced the Harrod’s Snow Bear which kick-started another tradition. Since then, they have offered an annual holiday bear sending even more shoppers to the second floor souvenir area. To see for myself, I followed the crowd. I was mesmerized by the holiday and souvenir displays but abruptly jolted from my daydreams by the massive shopping crowds. 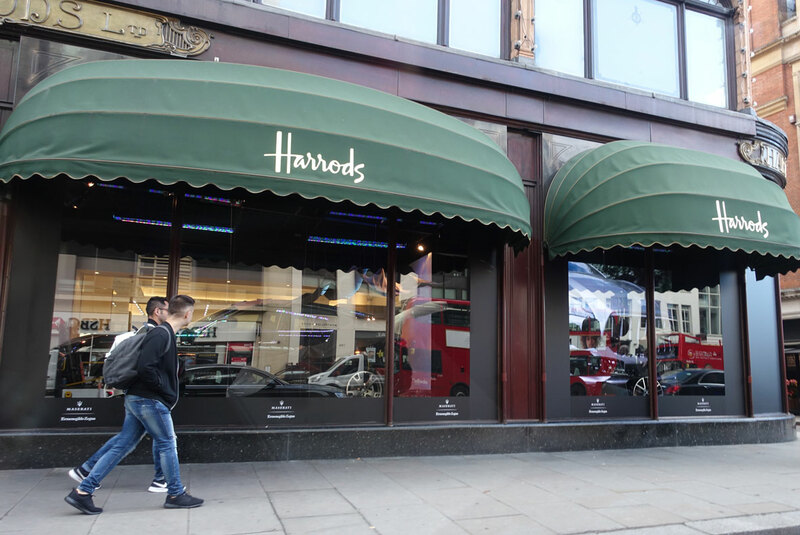 Harrod’s reports to have up to 300,000 shoppers per day and that day I felt certain they were all in the same department with me. Time passed too quickly and I had to leave. There are many entrances and exits and ways in which to navigate from floor to floor. I chose the Egyptian escalators which seemed fairly central in the store’s footprint. On my way down, as I walked off the escalator, I found myself in front of the Princess Diana and Dodi Fayed memorial. Their deaths in 1995 shook the world. Princess Diana’s funeral was the first time since President Kennedy’s death that I had witnessed world-wide mourning. The best part of Harrod’s was something that is not for sale. Next Article Iceland – The safest place on Earth…Can it stay that way? I’m sure they really do have something for everyone if the store is that big! The biggest stores I’ve ever been to are Macy’s in New York and El Corte Ingles in Barcelona. Both fairly large but certainly not 5 acres! The fact that Harrod’s also has the memorial sites of Princess Diana and Dodi Fayed make it go even higher on my bucket list. How cool! In one of those “small world” coincidences, I took my wife to see Harrod’s while on a 2-day stay in London. As you described it, the store is inundated daily with thousands of shoppers and tourists on many floor with many exits. My wife was determined to see and shop it all. We had one friend who had married and moved to London a few years before and I had lamented that we had not called and arranged for a reunion. After more than a couple of hours of following like a puppy from floor to floor, I told my wife I would be outside and pointed to a column that I would be leaning against and from which she could eventually claim me. Within one minute of staking my claim at this random spot, the one person I knew in all of London walked past me on her way into the store!